Today Jennifer got GOOD NEWS AGAIN: another good MRI. This makes almost 4 and a half years of good MRIs, going back to August 20, 2004. We enjoyed a couple of visits from Jennifer and Winston in the last few months, in November for her Oma's 80th birthday and after Christmas for a family get-together at the beach. Jennifer got through the winter with only a cold or so, and now is enjoying the good weather. MORE GOOD NEWS FOR JENNIFER: another good MRI result today, the latest in a string going back to August 20, 2004. We enjoyed visiting with Jennifer and Winston during a Spring Break with Monica and Toby in March. We also got to visit with Winston's mother in Houston, and his feisty 99-year old grandmother too. 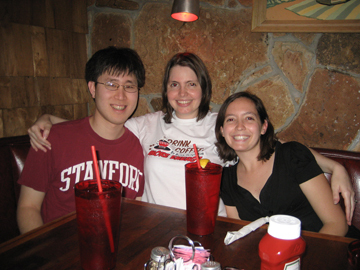 Winston, Jennifer, and Monica at the Shady Grove in Austin. 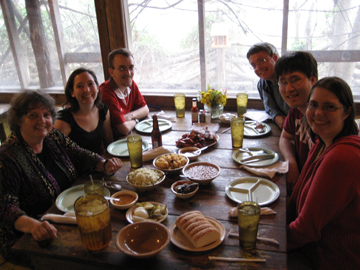 All of us at the Salt Lick southwest of Austin. We ate well. Jennifer and Winston will join us in Orlando for a celebration of the life of Jennifer's friend Katie Doyle. We'll also visit with Jennifer's cousin Elisabeth, her husband Danny, and their nearly-one-year-old daughter Evelyn.